The key, Sabshon says, is using debt prudently. “There have always been real estate investors who will borrow as much as lenders are willing to lend, but these types of investors are the minority,” Sabshon says. While there are some investors who eschew the use of debt, Sabshon is a proponent. “I believe it’s extremely poor business to buy real estate without some amount of financing,” he says. “Leverage is important.” Obtaining prudent financing can help enhance the performance of the property for investors. The return on a property with a mortgage is called a “leveraged return”. Sabshon says there are many variables to take into account when developing a financing strategy—for a piece of property, a portfolio of properties or a company. Within the world of commercial real estate investment, there are two primary types of debt: property-level debt and corporate-level debt. Property-level debt includes: mortgages on existing assets and construction loans for development or redevelopment projects. Both mortgages and construction loans are collateralized by a property — a shopping center or apartment building, for example. Similar to residential mortgages, if an investor defaults on the mortgage, the mortgage noteholder can take back the property. Property-level mortgage debt is the most common type of debt that commercial real estate investors use. There are many sources or holders of mortgage debt — from banks and institutional lenders such as life insurance companies, to issuers of commercial mortgagebacked securities (CMBS), to government sponsored entities such as Fannie Mae and Freddie Mac. Some investors purchase properties on an all-cash basis and obtain mortgages later. According to industry experts, investors sometimes choose this approach because sellers may prefer all-cash buyers. 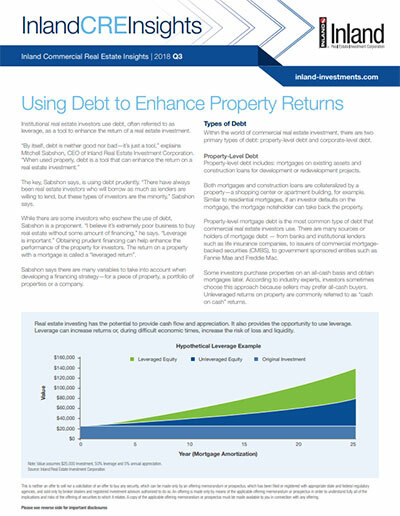 Unleveraged returns on property are commonly referred to as “cash on cash” returns. Note: Value assumes $25,000 investment, 50% leverage and 5% annual appreciation. * Debt service is the cash that is required to cover the repayment of interest and principal on a debt for a particular period. + Annual return is calculated dividing Annual Cash Flow by Down Payment (Money Invested). There are many forms of corporate-level debt, but two of the most common in commercial real estate are lines of credit and corporate bonds. Lines of credit are provided by financial institutions. Unsecured corporate debt often has a floating interest rate that may be lower than second mortgage debt. Companies can use this money for any purpose, not just the purchase of property. “A line of credit allows companies to have flexibility and, when used appropriately, signals that a company is financially sound and has managed its debt in such a way as to be attractive to large institutional financing partners,” says Sabshon. A number of large commercial real estate owners issue corporate bonds. Investors buy the bonds, giving the issuing corporation the cash it needs and, in return, the investor receives a return of principal plus interest. The amount of money that can be raised through corporate bond issuances and the interest rate offered are dependent on several factors including demand from bond investors, portfolio quality, extent of other leverage and quality of management. Like municipal bonds, corporate bonds are graded by rating agencies according to the corporation’s credit history. Investments in real estate assets are subject to varying degrees of risk and are relatively illiquid. Several factors may adversely affect the financial condition, operating results and value of real estate assets.